The Saradha ponzi scam is back in the limelight with Mamata Banerjee’s showdown with a CBI team seeking to question the Kolkata police commissioner. New Delhi: The central government moved the Supreme Court Monday accusing the Mamata Banerjee-led West Bengal government of stopping CBI officers from conducting a probe into the Rs 10,000 crore Saradha ponzi scam. After the solicitor general Tushar Mehta mentioned the case before a bench headed by CJI Ranjan Gogoi, the court said it would hear it Tuesday. It also asked the CBI to submit proof to prove its allegation that the Kolkata police commissioner had destroyed key evidence related to the ponzi scam. The Centre’s move follows an unprecedented showdown between CBI officials and Kolkata police in the city Sunday night. 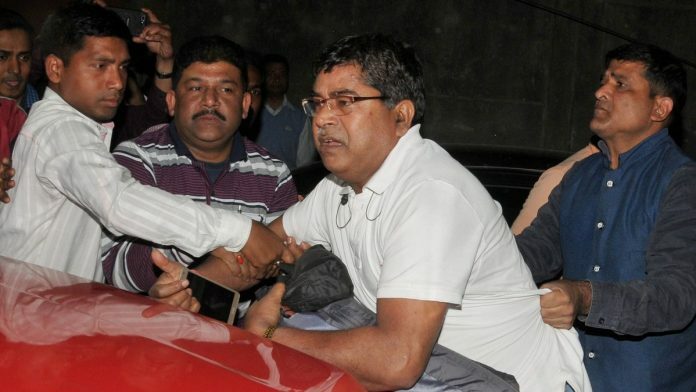 As a CBI team arrived at the residence of Kolkata police chief Rajeev Kumar to question him on the Saradha scam, state police reportedly stepped in and detained officers of the investigative agency. An IPS officer of the 1989 batch, Kumar headed the special investigation team (SIT) that investigated the Saradha and Rose Valley ponzi scams before the apex court transferred the cases to the CBI in 2014. According to the CBI, a team of the agency had arrived at the police commissioner’s house Sunday night after he allegedly ignored multiple notices seeking his presence for questioning over “missing documents and files”. Soon after the fracas, Chief Minister Mamata Banerjee and Kumar sat on a dharna late Sunday night. As opposition leaders from around the country spoke up in Banerjee’s support, alleging that the Narendra Modi government was again misusing the CBI to settle political scores, several Twitter users posted that the allegation was unfounded as the Saradha scam probe was being monitored by the Supreme Court. Why is arresting a police official for a probe ordered and monitored by the Supreme Court of India a danger to democracy??? I mean no politician is being arrested now right? However, while the Supreme Court did order the CBI to investigate Saradha and other Ponzi schemes, it is not monitoring the probe. In May 2014, a bench of Justices T.S. Thakur and C. Nagappan transferred the probe of several alleged ponzi scams carried out in West Bengal and the northeast to the CBI after serious allegations of money laundering, political involvement and regulatory failures emerged. It also directed the Enforcement Directorate “to expedite the investigation initiated by it into the scam and institute appropriate proceedings based on the same in accordance with law”. The apex court’s decision came “with a view to ensure credibility” of an investigation that involved inter-state ramifications and crores of rupees. In doing so, however, the court made it clear that it would not constitute a monitoring committee just yet. “We do not for the present consider it necessary to constitute a monitoring team to monitor the progress of the investigation into the scam. But we leave the exercise of that option open for the future,” the bench said. The top court clarified that the transfer of the investigation to the CBI would not affect the proceedings pending before the inquiry commissions established by the state or stall any action that is legally permissible for the recovery of money to pay back duped depositors. The Supreme Court also directed state police agencies to provide the fullest cooperation to the CBI, including assistance in terms of men and material, to enable the latter to conduct and complete the investigation expeditiously. Placing its faith in an independent probe, the SC said a probe by state police in a scam that may involve the patronage of people occupying high positions will hardly carry conviction. “It is true that a lot can be said about the independence of CBI as a premier investigating agency but so long as there is nothing substantial affecting its credibility it remains a premier investigating agency,” it added. Ponzi schemes are cons sold to unwitting depositors as a money-multiplying mechanism. You invest a certain sum, and are promised double the returns in a small window of time — initial investors are kept pleased with money secured from subsequent investors, but the chain of depositors soon becomes unwieldy to maintain and, slowly, the scam collapses. In 2013, a major business group in West Bengal, the Saradha Group, came under the scanner for allegedly duping crores of investors in a similar way. The group, a consortium of 200 companies, had allegedly promised the poor and the marginalised huge returns in lieu of their investment, and succeeded in swindling crores from investors before it collapsed in April 2013. Many politicians and personalities were associated with the Saradha brand, which made it popular with the crowd. It was around the same time that several similar scams were reported in other states, including the Rose Valley scam in West Bengal. While handing over the probe to the CBI, the apex court observed that the investigation had revealed the involvement of political and other influential personalities. It added that the role of regulators like SEBI, RBI and authorities under the Companies Act would come under the scanner. It further observed that the scam hit several states like West Bengal, Tripura, Assam and Odisha, involving “a collection of nearly 10,000 crore (approx.) from the general public especially the weaker sections of the society which have fallen prey to the temptations of handsome returns on such deposits extended by the companies involved in the scam”. Many, or maybe ALL the cases of corruption and fraud begin investigated are genuine. But why has NOT EVEN ONE CASE been brought to closure or near closure stage until now? Even a simple case of land selling or buying, I don’t know the details, by Robert Vadra has not gotten sorted out. It first came up in 2013 before elections; at a routine rate of follow up, it should have been closed in not more than two years, say by 2015-16. The guilty would have been pronounced long ago and people would have forgotten about it by now. There’s the crux: this government DOES NOT WANT PEOPLE TO FOEGET these cases, so they can be dug out again around the next election time (which is now). By following the same pattern with all cases — to rake them up close to elections — this government has made all of them look like fudged cases. People may or may not doubt the wrongdoers, but they surely doubt the government’s intentions.